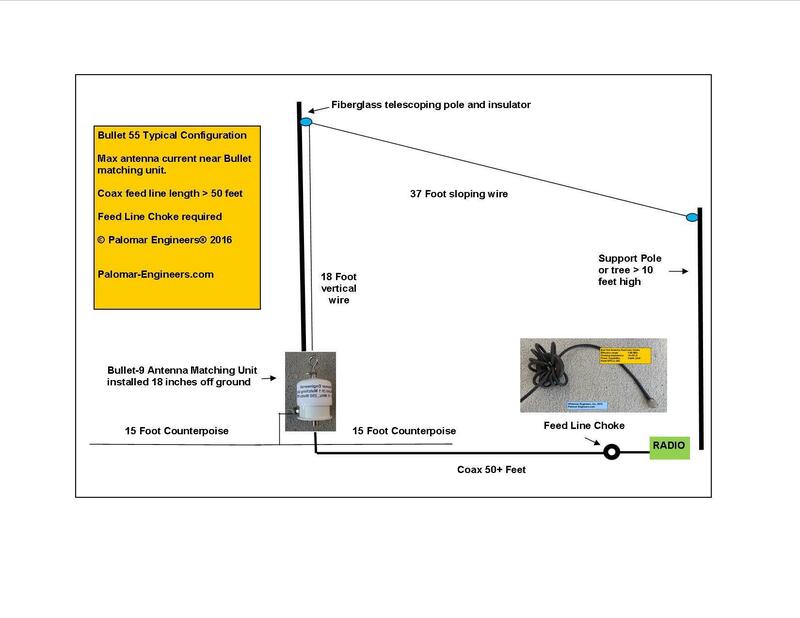 The key to end fed antenna success is the matching network interface between the long wire antenna and the coax feed line and feed line choke at the transceiver. 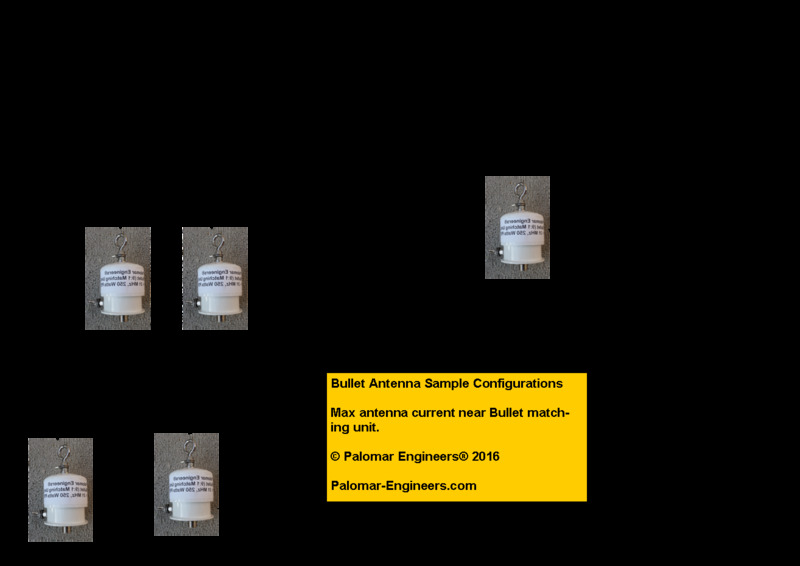 Palomar Engineers employs a dual core matching system that offers wide bandwidth (1.8-61 MHz), 500 watt PEP rating, and a connection for a counterpoise or ground if desired. stations all over the world under the right conditions. The Bullet uses all stainless steel connectors and a dual core ferrite 9:1 unun for higher power rating then many competitive products. 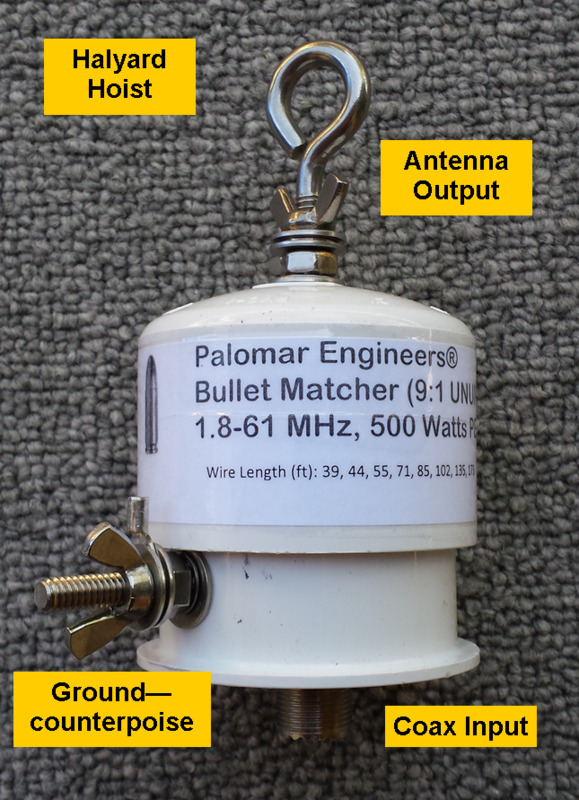 For best results raise the Bullet matching unit as high as possible (use a tree or vertical support) and then extend the antenna wire horizontally or as an “L” (horizontal with vertical end drop). The antenna may also be deployed as a sloper with the Bullet matching unit at the top (best) with the wire sloping toward the ground (with the end high enough to avoid contact by humans or animals), or at the bottom of the sloper with the antenna wire rising to a higher point (see typical configurations below). Use a good quality 50/72 ohm cable adequate for the power level of your station.The Bullet-80 matching unit is rated for 500 watts PEP for SSB and 150 watts continuous carrier for AM, FM, digital modes, or 375 watts CW. If the matching unit becomes warm to the touch after transmitting at high power, reduce the power output or the internal matching unit may become damaged. I am e-mailing to tell you how impressed I am with the Bullet-9U I received on 3/11/19. I immediately threw a 44 foot wire across my tile roof (in Florida) and began to tune up on 20 meters CW. I was running only about 15 watts to tune the wire and immediately, a station in Ontario came back with "579".) I got down to a 1.5:1 match and increased power to 100 watts. I heard a ham in Croatia calling CQ and got a "599" from him. Switched to 40 meters and before I could tune up, with about a 5:1 SWR, I was called by a ham in Cuba with a 579! And this with the bands in "poor" condition. I never expected such fantastic results. Thank you for a great product.